Energy storage is charging ahead, thanks in no small part to the work of two utilities, in conjunction with the U.S. Department of Energy. Duke Energy and Southern California Edison are now operating two of the biggest such projects in North America, with each optimistic that its investment will pay off. When most people think of energy storage, they envision a system whereby power is siphoned off the grid at night, harnessed in a device, and then released during the day when the demand for electricity peaks. While that’s the ultimate goal, the more immediate application is to infuse the grid with electrons when the switches trip and the lights would otherwise flicker out. “The batteries provide grid support that grid operators would otherwise not have,” says Jeff Gates, Duke’s in-house expert on its Notrees Energy Storage Project in West Texas, where it has installed lead batteries next to a wind farm. He adds in a phone interview that when the battery storage operator detects any changes in “frequency” as a result of “power surges” that it can immediately respond before the grid operator – Electric Reliability Council of Texas – even realizes that a problem has been averted. 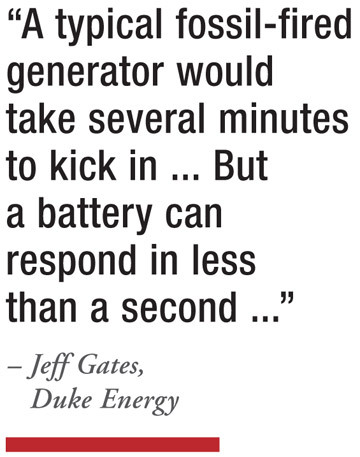 Duke is paid the same as any traditional generator that would deliver electrons on demand. The “Notrees” project is 36 megawatts that can charge or discharge at full power for 30 minutes. It uses advanced lead batteries. The project, which has been operating since December 2012, cost $44 million. That is split between the utility and the Energy Department and it is part of the 2009 stimulus plan. This specific undertaking can generate 24 megawatts hours. Similarly, Southern California Edison just started its two-year demonstration, called the Tehachapi Energy Storage Project. It is located on a wind farm about 100 miles north of Los Angles – an undertaking that is also part of the 2009 federal stimulus plan. Altogether, the deal is projected to generate 8 megawatts for four full hours, which equates to 32 MWhs. It uses lithium-ion batteries. “We are trying to solve multiple problems like minimizing congestion and storing renewable energy at night and using it during the day,” says Doug Kim, director of advanced technology for SoCalEd, in an interview. He adds that the device is expected to provide the type of “voltage support” that Duke is now doing, or the ability to instantaneously inject electrons when there is high customer demand. What’s the main difference between the two utilities’ batteries? Duke’s battery has more power than that of SoCalEd’s system – or the capacity to convert direct current (DC) coming from the batteries to alternating current (AC) that enters the grid. But Duke’s system does not have as much energy, which drives the battery. The Energy Department has funded 15 other projects – some $185 million in all – to advance energy-storage technology. That’s a drop-in-the-bucket when compared to what the International Energy Agency in Paris says is needed, or $380 billion by 2050 – across the globe. But that does not deter DNV GL, which says that there has been more megawatts stored in the last year – worldwide – than over the last 30 years. California’s mandate to install 1,325 megawatts of energy storage by 2020 will be a catalyst, it adds. And that’s on top of the 200 megawatts that are now online in Hawaii. 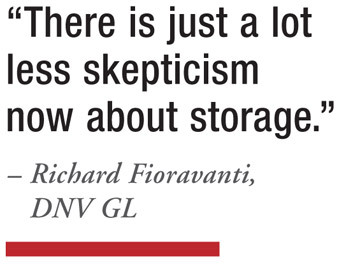 Fioravanti goes on to explain in an interview that there are several storage devices vying for market position and that he would expect a handful to emerge as the top contenders. As for lithium-ion batteries, they are able to store and to discharge electricity at any time, although they have a limited duration of around 30 minutes to 1 hour. Fast response flywheels and kinetic energy storage are similar to that. Meantime, certain devices can go for 6-to-10 hours, such as NGK Sodium Sulfur Batteries. That product is able to cover 98 percent of all brownouts and it would be ideally suited as back-up power. “As ‘power’ devices typically discharge from 20 minutes (flywheels) to one hour (for the Lithium family of devices), and ‘energy’ typically discharge from 2-10 hours, just about all technologies can in inject for 30-45 minutes,” he notes. However, certain devices are best-suited for specific applications. Take wind integration: Because it is an intermittent source that only works when the wind is blowing, the battery would need to be able to discharge multiple times per day. And it must be able to do so in the most efficient manner possible, says Fioravanti. For those reasons, he explains, batteries and flywheels are the preferred choice. So what about cost? Generally speaking, just about everyone agrees that energy storage is a good idea that could add tremendous value in electricity markets. But the disagreement comes over who will pay for it. 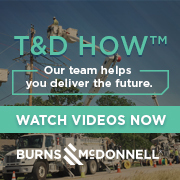 If a project is going to cost as much as $1 billion, utility executives are going to want to see an awful lot of data – and they are going to want to know how this price tag will be shared. Utilities are, by nature, conservative organizations that have long-term outlooks. When they build power generation, they are looking out at least 20 years. To that end, energy storage is no different – something that will take more than 10 years to result in an return on investment, says Jay Whitacre, engineering professor for Carnegie Mellon University in Pittsburgh. Whitacre goes on to explain in an interview that for energy storage to be cost competitive, it would need to be able to deliver electricity at about 10 cents per kilowatt-hour over the lifetime of the system. That would put it on par with “pumped storage,” which costs between 3 cents to 8 cents per kWh. Right now, the “levelized cost” – the cost of continuous operations – of battery production is between 15 cents and 30 cents per kWh, depending on the application and the type of battery. Prices will fall as increasing amounts of green energy come into the market. In Germany, for example, such power is heavily subsidized while developers also receive incentives for energy storage devices. As economies of scale are developed, technologies improve and costs drop. How long will it take for energy storage, generally, to be reliable and competitive? “The more programs there are, the faster the cost of technology will come down,” says Whitacre, who is also the founder and chief technology officer of Aquion Energy, an energy storage technology company in Pittsburgh. Ken Silverstein is Editor-at-Large for Public Utilities Fortnightly. Contact him at ksilverstein@pur.com.